The Killer Wail is a special weapon in Splatoon. When activated, the Killer Wail projects a series of concentric circles in its intended path for a moment before firing massive sound waves in the user's ink color shortly after. They splat any enemies they touch, ignoring buildings or other obstacles. While the Killer Wail does not spread any ink of its own unless an opponent is splatted, it is useful for gaining or keeping control of the stage. Use the Killer Wail through walls to surprise unsuspecting enemies that pass by. It is advisable to activate the Killer Wail from around a corner as a surprise attack, to watch the enemy run into it and splat themselves. It requires approximately two seconds to channel and activate the Killer Wail. Make sure it is activated early to get the hit. Though the main use of the Killer Wail is to splat people, it is also excellent for chasing away enemies. Aim it at popular pathways, common sniping spots, Splat Zones, or Tower routes to essentially lock out enemies from these areas. The Killer Wail is excellent against the Kraken or Bubbler because of its huge knockback. For instance, teammates sharing a Bubbler on top of the tower in Tower Control can all be pushed off with a well-aimed Killer Wail. The Killer Wail is excellent to use at corridors where the enemy have hard time to move aside. It is very strong on stages such as Walleye Warehouse, Port Mackerel and Camp Triggerfish. The Killer Wail leaves a set of circles when it is about to activate. Watch out for them when they are visible and dodge it in squid form. If an enemy has the Killer Wail as their special, take caution when walking around corners as they may silently channel it as a surprise. The Killer Wail makes a loud guitar noise. This allows the player to know that someone is preparing an ambush. Use the noise to dodge it before retaliating. Repeating the final boss level can help practice dodging the Killer Wail, as one of his attacks uses the Killer Wail. — Changed how the Killer Wail's aiming prediction is displayed. A Killer Wail firing across the map. Close-up of an activated Killer Wail. Concept art of various weapons, with the Killer Wail in the middle. The Killer Wail used by Pearl in the Octo Expansion. In Splatoon 2, as explained in Sunken Scroll 11, no Special Weapons from the first game return. The role of the Killer Wail was indirectly replaced by the Sting Ray, in that they both shoot an extremely long beam that can pass through walls. 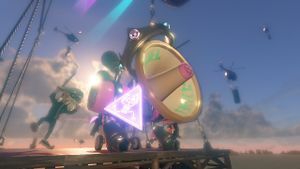 During the final boss battle in the Octo Expansion, after the player has successfully completed the objective, Pearl uses a Killer Wail together with her battle cry to defeat the final boss. Here, the Killer Wail produces a torrent of ink instead of the sound waves. This Killer Wail has Off the Hook's Splatfest logo on it off to the sides, a triangle neon warning sign, and a big crown, matching the one Pearl wears during the Octo Expansion. Killer Wail is a pun on Killer Whale. When launched, the Killer Wail emits a guitar wail that lasts for a few seconds. The Killer Wail most likely causes enemy Inklings to disintegrate, as they are supposedly made of liquid. A Killer Wail is used by the final boss of Octo Valley in the second phase and later. The Inkling character in this game uses the Killer Wail in their Final Smash. Italian Tintofono From Tinta (Ink) and the suffix Fono, used in relation to sounds. Spanish (NOA) Berreón From the same noun Berreón (Bawler). This page has been accessed 61,757 times.